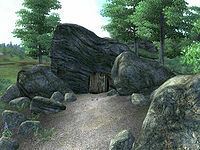 Sideways Cave is a medium-sized cave northeast of the Imperial City containing monsters. 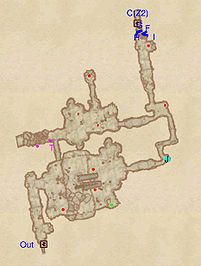 It contains three zones: Sideways Cave, Sideways Cave - Hidden Lake (a large subterranean lake and waterfall), and Sideways Cave - Lost Abagarlas (the ruins of an ancient Ayleid city, Abagarlas). Abagarlas is completely hidden deep underground and can only be reached through the secret underground lake. In all three zones of the cave you will find remains of previous, unlucky, explorers. In the ruin and around the lake you'll find Ayleid tablets which suggest that the city was destroyed by a "child of Meridia", probably by the flooding and extraordinary plant growth in and around the city. 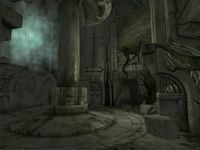 At the end, in the Abagarlas throne room, is the recently deceased body of a wealthy Altmer scholar who was most likely responsible for the tablets. "Stone-Settlers (builders?) not rest (wake?) Meridia. Terror of the Most Terror. Haste to safehome." "Fourth Star Hour (time?) Terror-of-the-Most-Terror of Meridia come (came?)." "Meridia-child, Earth root power, sea wave like (earth like a flood?). People-out (escape? present tense? imperative?)." 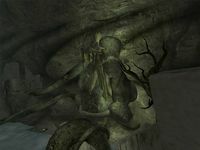 A half-collapsed shrine to Meridia can be found in the Ayleid Ruins, suggesting that the original inhabitants of Abagarlas may have been Meridia worshippers. 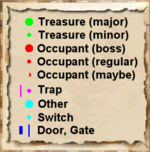 The official Prima guide lists Sideways Cave in its Freeform Quests section as one of the more interesting dungeons and has this to say about the tablets: "Can you put it all together? The big picture is that, long ago, Ayleid settlers stumbled onto this grotto. They made it their own--in the end, too much their own. 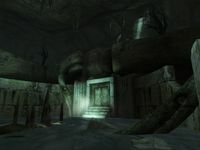 In doing so, they uncovered a forgotten shrine to the Daedra lord Meridia. 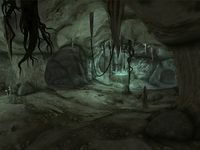 Meridia's vengeance for this violation was swift: She crushed Abargarlas [sic] with her stone roots and, incensed that some survivors escaped, buried the grotto almost entirely." This cave contains 3 Cairn Bolete plants and 19 Wisp Stalk plants. 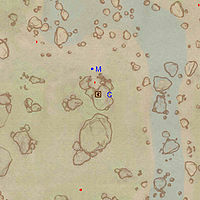 This location's map marker (M on map) is named Sideways Cave (editor name SidewaysCaveMapMarker). The entrance door is SSE of the marker, 50 feet away. Sideways Cave resembles any other cave for its first section, with the corridor leading to a room with a large chasm. The plateau across the room can be reached by descending into the chasm (either by jumping below or walking down a formation of rocks). From there, a corridor leads to a room with a cave-in trap to the west and an opening to the east, which leads to two paths. The path on the northern side of the room leads to a dead deer, while the path to the east splits into two more corridors; one leading to the second plateau and the other to Sideways Cave - Hidden Lake. Follow the path to the plateau and you will find a corpse of a treasure hunter. Continue on to the plateau where a chest to the south lies buried underneath a heap of skeletons. Once done here, head on to Hidden Lake. While the previous section is unremarkable, Hidden Lake opens up into a fairly linear narrow chasm filled with shallow water. Broken boats and remnants of an Ayleid ruin litter the flooded chasm. 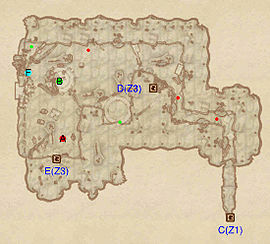 The chasm soon becomes less narrow as it opens up into a large room with Ayleid arches and more ruins. On a large stone ring on the southern wall of the chasm is a cask and two skeletons. Another cask lies in the middle of the chasm and another in the far western corner of the room (mostly hidden by water; an Ayleid tablet lies a short way from the cask). Near this cask is a rock covered statue of Meridia. The plateaus above are not meant to be reached, but it is possible to get up there by way of a long root near the door to Sideways Cave - Lost Abagarlas (though high acrobatics might be necessary). A door leading from Lost Abagarlas is on a ledge overlooking the middle section of the chasm. 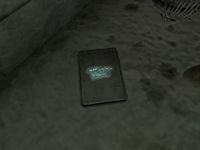 First Ayleid Tablet at location F on map: "[A hasty translation is scrawled here...] Meridia-child, Earth root power, sea wave like (earth like a flood?). People-out (escape? present tense? imperative?)." The door from Hidden Lake opens up to a partly destroyed corridor, where a second Ayleid tablet lies on the ground near a skeleton. The corridor then splits into two. The room to the south holds a few potions, but a cave-in trap prevents one with little Acrobatics from going up the stairs. The room to the north holds enemies and goes on downstairs to a pathway destroyed by roots. The pathway goes on, with stairs going up to a room which continues to the room with the cave-in trap. 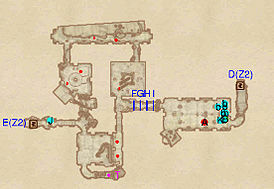 The last corridor, guarded by gates that open as you come close, leads to the last room, where a few casks, another Ayleid tablet, and a dead scholar can be found. A door in the back of the room goes back to a ledge in Hidden Lake. Second Ayleid Tablet at location J on map: "[A hasty translation is scrawled here...] Fourth Star Hour (time?) Terror-of-the-Most-Terror of Meridia come (came?)." Third Ayleid Tablet at L on map: "[A hasty translation is scrawled here...] Stone-Settlers (builders?) not rest (wake?) Meridia. Terror of the Most Terror. Haste to safehome."